It's hard to believe that I have just completed my ninth first day of school as a teacher and twenty-seventh first day of school overall. The first day has always been a whirlwind for me, and it never feels as if there is enough time to do that which I had planned. Some periods I met for less than 30 minutes, another met for the full 42 minutes, and I saw my 9th period kids for all of 3 minutes. I often wish that we had a different set up for our first day, but when all is said and done, there really isn't much you can do different from what we are doing with what we need to do. In the end, it's just a matter of dealing with what's given. And, of course, that is the problem I am facing this year. As of today, there will be 178 student enrollments (some students come 2-3 times a day) that roll through my classroom on even days and 161 on odd days (my study hall numbers vary), and I am wondering how I will meet the needs for each of these students. Each of these kids is going to have a different need that I must meet and adjust for. How will I be able to do this? Luckily, working in a flipped classroom will make up for some of the necessary adjustments. Students will have a choice in how to receive the information to apply to the content. They could view a podcast where they can see problems and hear me talk about the topics. They could work through the slides for the podcast without the audio and try to figure out the steps and create reasons why those steps work. They could take the notesheet and work on filling it in by trying things out and verifying it afterwards. This is a process that worked quite well with my Integrated Math 2 students last year, and I'm curious to see how it works not only with my Geometry students, but in classes that are as large as they are. The big question is will I be able to assist the students that need it in class, or will I not be able to get around to them? Will they step up and collaborate as I envision they will? Time will tell. In order to deal with both the sizes of my classes and the potential for collaborative learning, I've adjusted the way my classroom is set up. No longer will I arrange in rows and columns, but instead in clusters that allow for students to better work together with those around them and allow for me to move around the space. 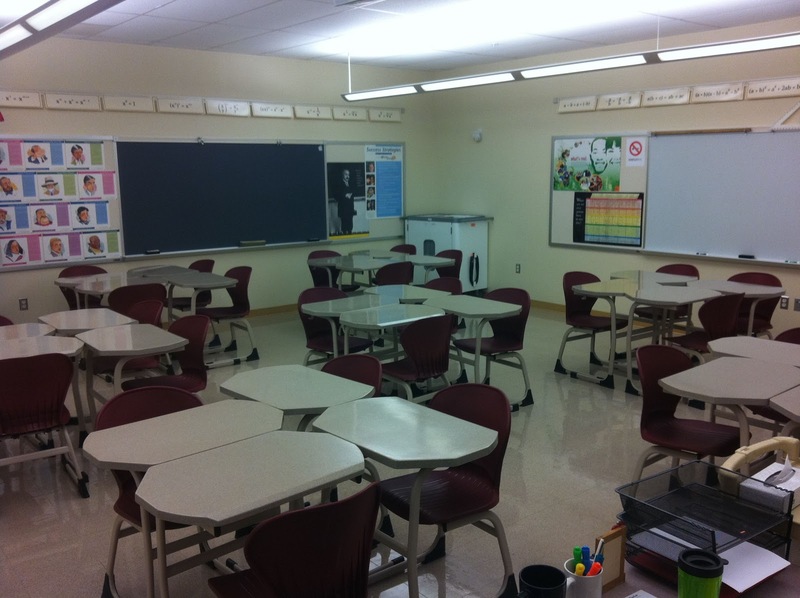 I had used a very similar configuration last year, and it lent itself quite well to work in the classroom. The next question is how do I adjust for assessment (or should I even do so)? I would love to be able to trust my students so that they do not borrow work and answers from each other and truly see what they know and don't know, but we all know high school kids, and the temptation to look at another's paper is something that is difficult to overcome. I don't have the time to adjust desks for every assessment, and different classes will be assessed on different days, so how do I account for this issue without driving myself crazy? Labels: "first day" "flipped classroom"